There’s fashion designers and then there’s fashion designers that get fabric. Designers Jeffery Costello and Robert Tagliapietra know how to conquer both. 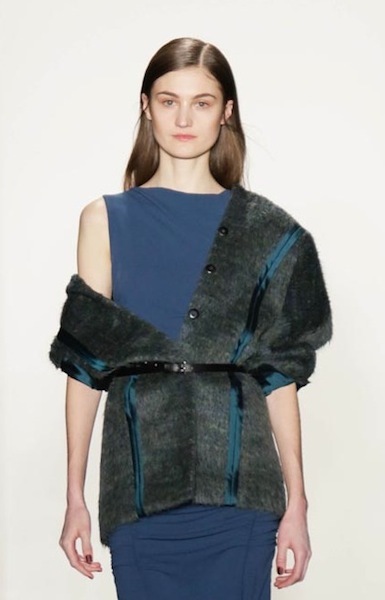 Their Costello Tagliapierta Fall 2014 show was held at the too-cool Milk Studios during NYFW. We love that their fabrics tell their own stories every season, and that’s apparently what they aim for. For this fall set, the two developed a lovely silk jersey with a dry hand. They even created their own printed artwork…and we’re obsessed. This assortment is heavy on the jewel tones and never short on airy femininity. There’s dresses galore and a lovely selection of separates that can be swapped interchangeably. Cropped tuxedo pants and high-waisted skirts are all abuzz and we can’t stop fawning over the kimono-sleeved cardigans and dresses. Looks can be dressed up or down, staying true to the line’s evident versatility. It’s clothing for the contemporary girl…confidence included. The CT customer is as cool as a cucumber. Take a look at these models, these clothes exude female strength and that’s a win for everyone. Look good and feel good wearing these wonderful pieces. fdmLOVES COSTELLO TAGLIAPIETRA Fall 2014 selects by Brigitte Segura, written by Allison Ripa.